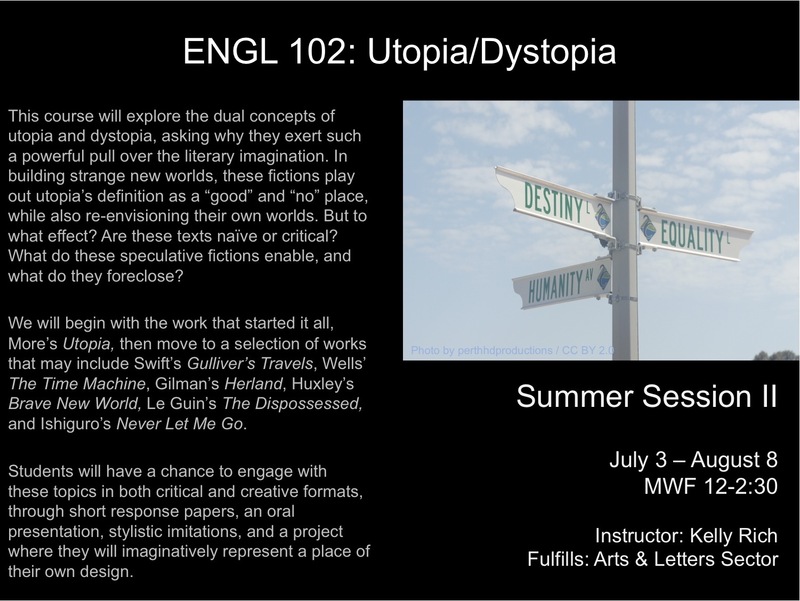 This course will explore the dual concept of utopia and dystopia, asking why it exerts such a powerful pull over the literary imagination. In building strange new worlds—for better or for worse—these works also re-envision their own, playing out the definition of utopia as a “good” and “no” place. But to what effect? Are these texts naïve or critical? Do they impose their vision of the perfect society, or do they allow for new forms of social and political possibility? What do these speculative fictions enable, and what do they foreclose? We will begin to address these questions with the work that arguably started it all, More’s Utopia, then move to Swift’s Gulliver’s Travels, Wells’ The Time Machine, Gilman’s Herland, Huxley’s Brave New World, Ursula Le Guin’s The Dispossessed, and finish our class with Ishiguro’s Never Let Me Go. Through these texts, as well as a selection of theory and criticism, we will develop a critical vocabulary for analyzing utopian and dystopian literature, considering issues of race and ethnicity, the environment, class divides, the management of power in legal and political structures, forms of gender and sexuality, and the role of technology. Students will have a chance to engage with these topics in both critical and creative formats, through short response papers, a longer essay, stylistic imitations, and a project where they will imaginatively represent a place of their own design.